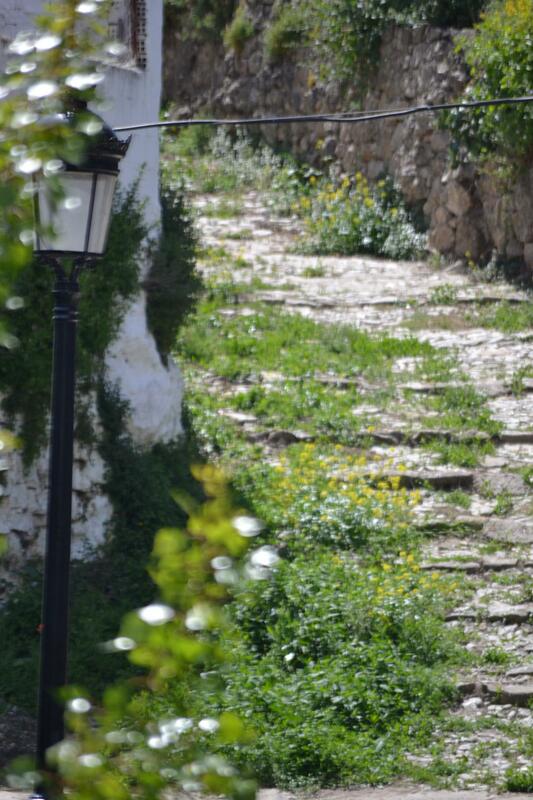 Recommended month to visit it: June. 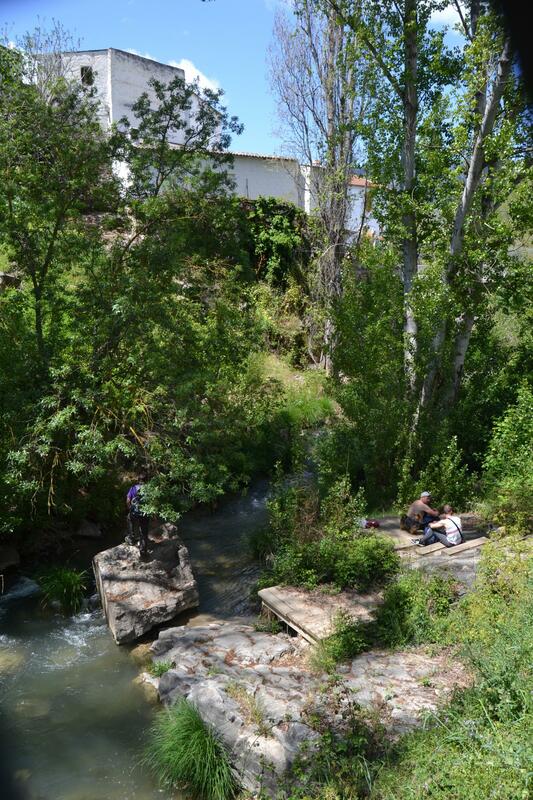 While observing the beauty of the Turón River and surrounded by the splendid landscape of Sierra de la Carrilla [Mountain Range of la Carrilla] or Sierra Prieta [Prieta Mountain Range], we arrive at this canal which supplied water to an ancient medieval water mill called “La Fábrica de Harina” [The Flour Factory] or, more recently, “La Fábrica de Salvador” [The Factory of Salvador]. 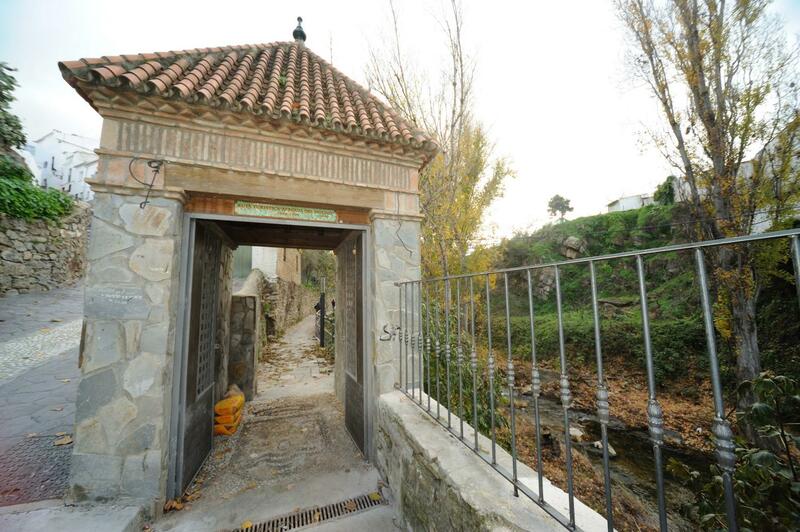 This was one of the four flour mills that existed in El Burgo. 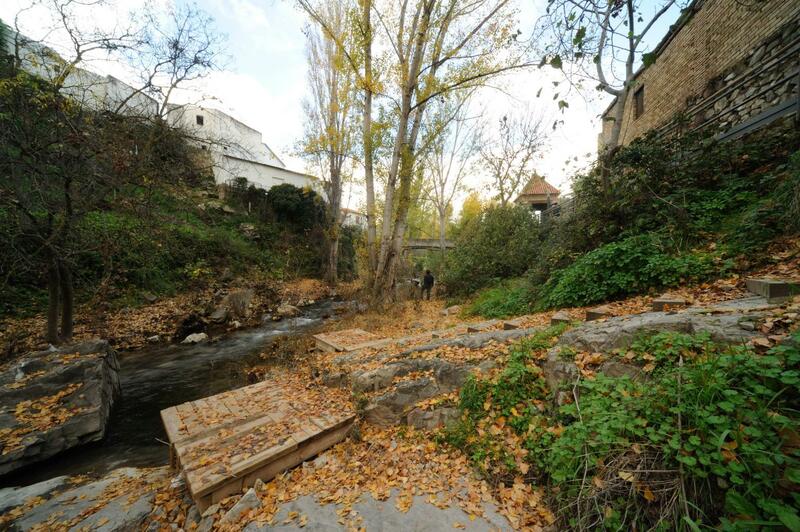 Along with the other three, this mill has been witness of the reliance of the municipality on the river throughout its history – it supplied its water and its strength so the agriculture and the industry could flourish. 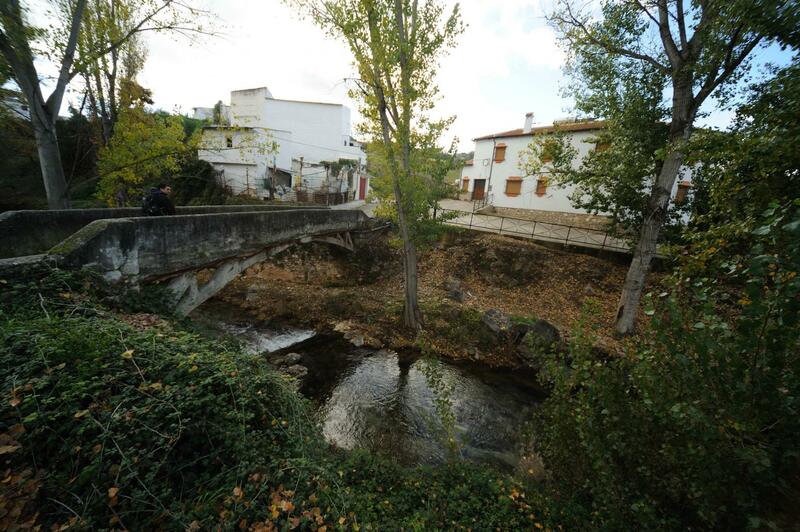 This is why its inhabitants, claiming it for themselves, called it River of El Burgo as it crossed their town. 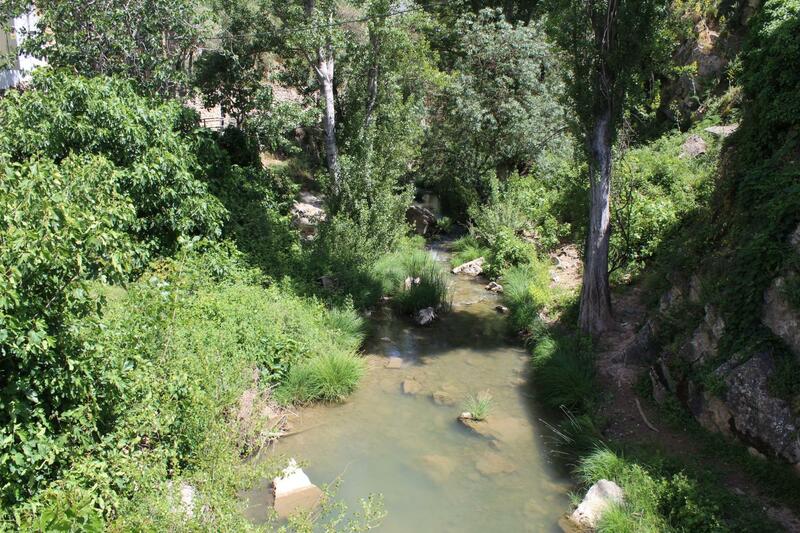 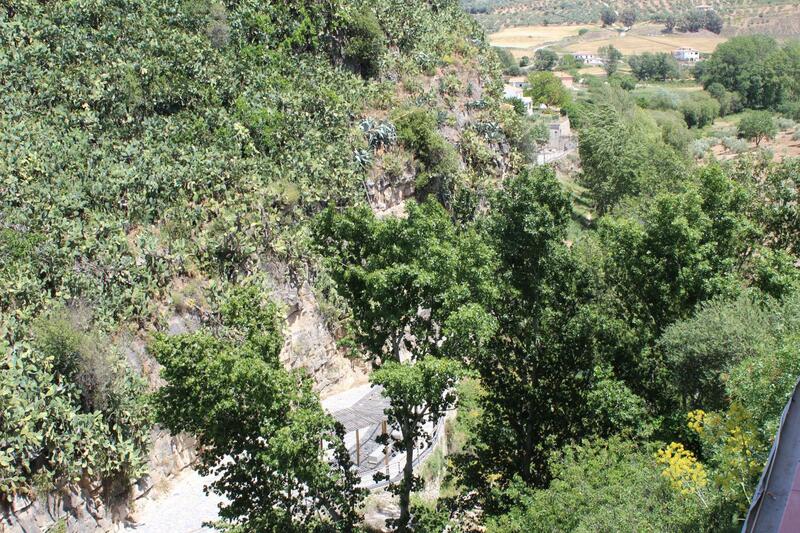 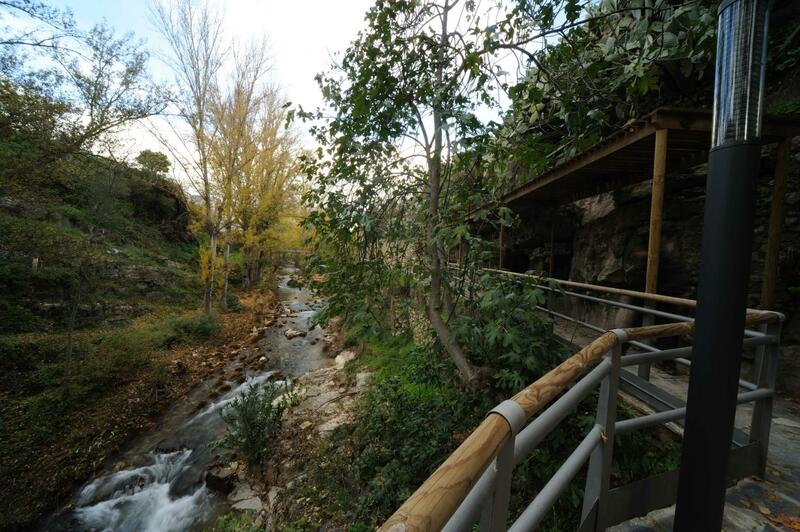 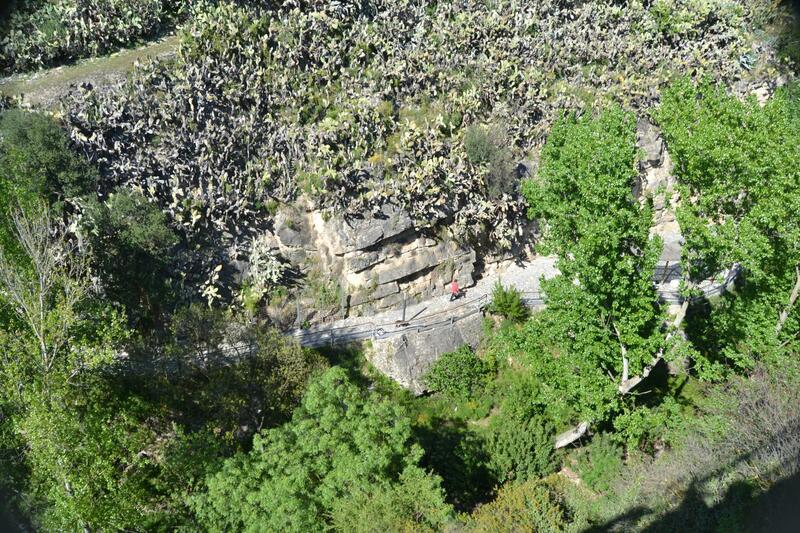 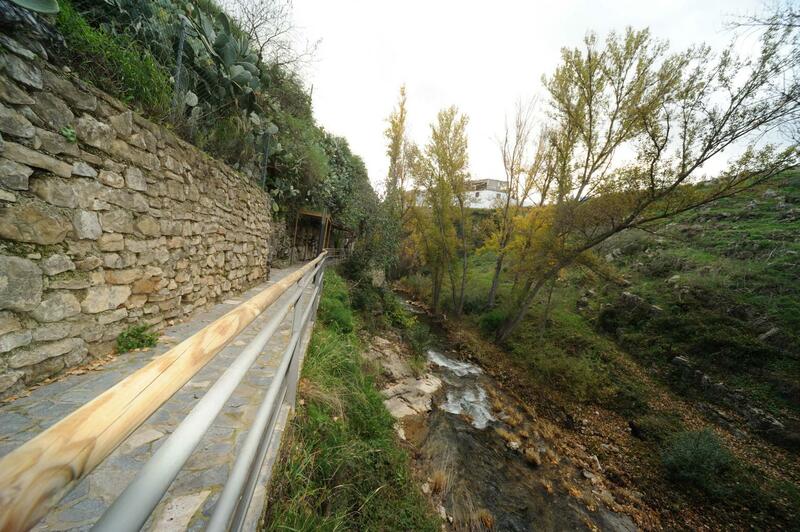 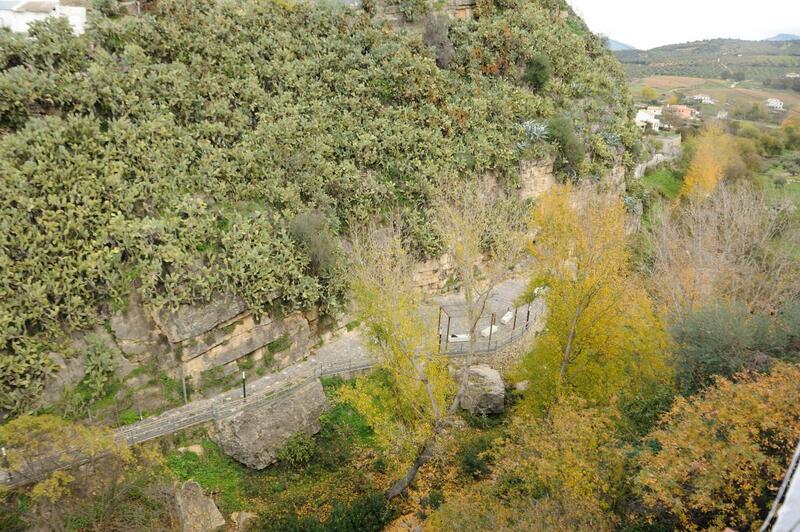 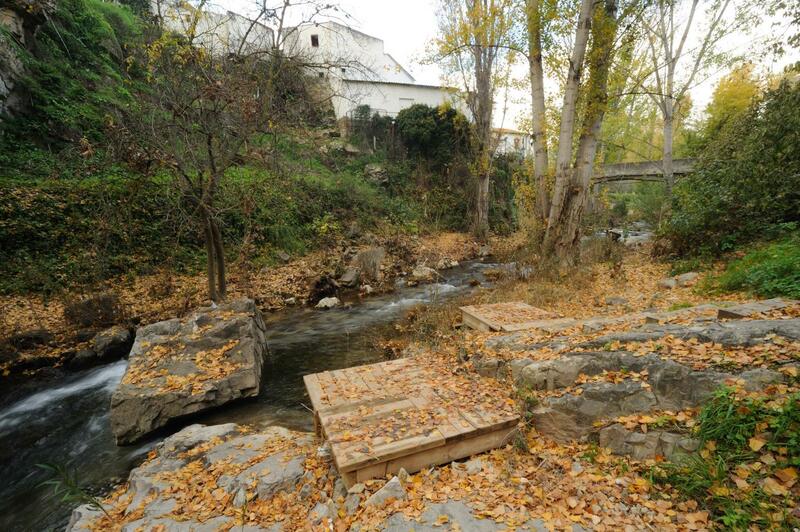 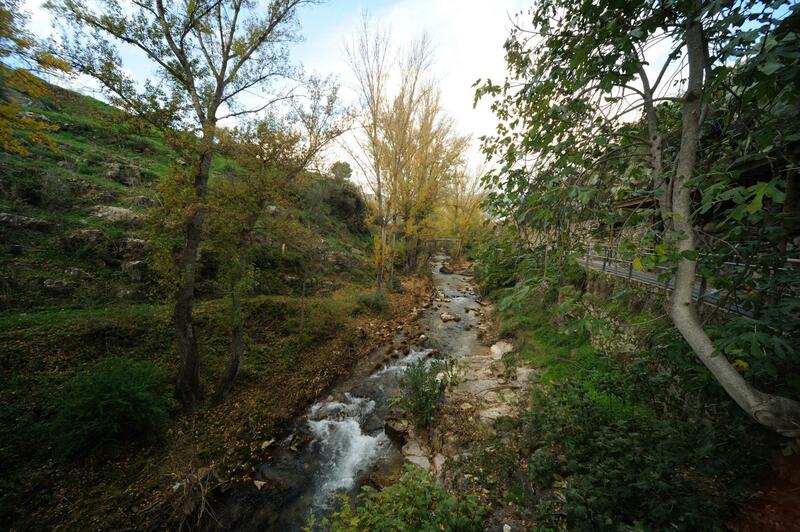 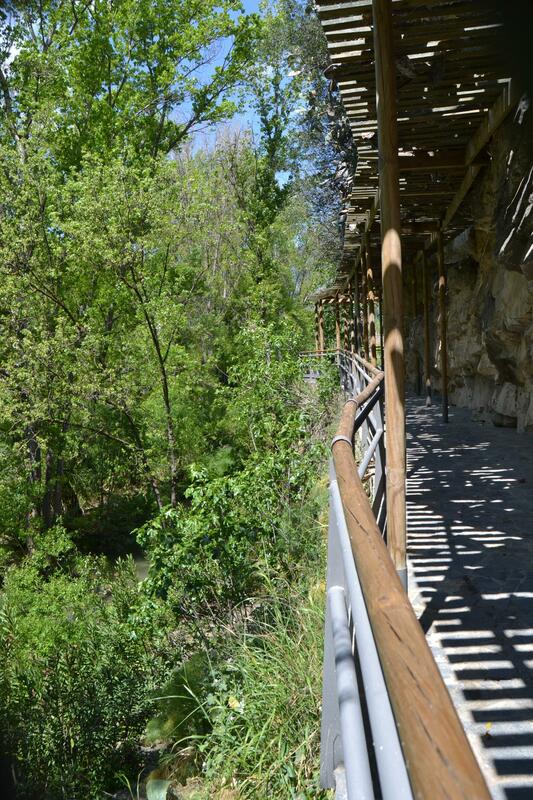 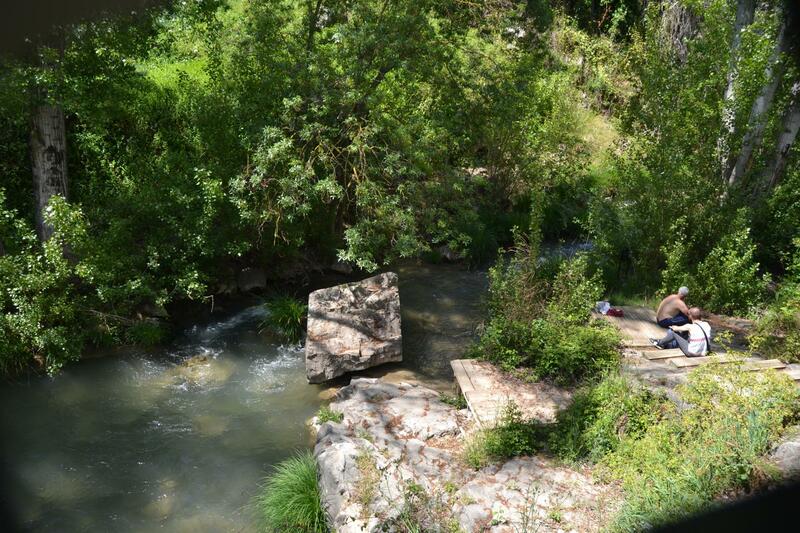 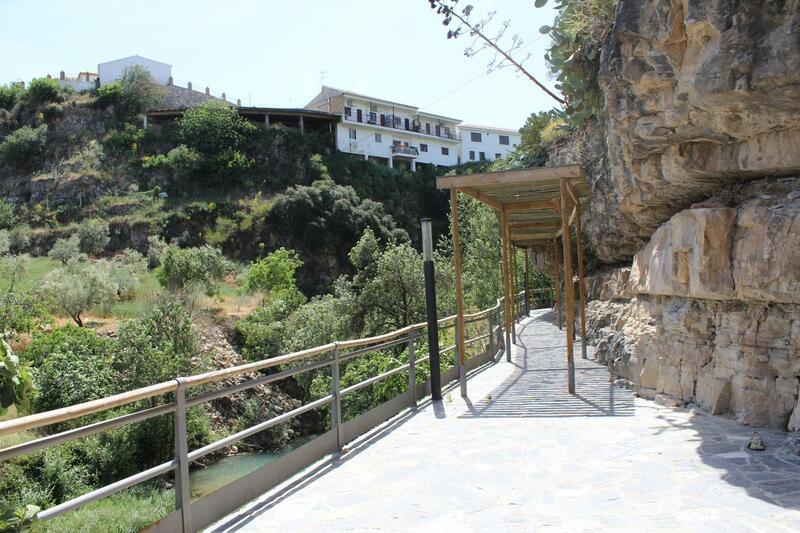 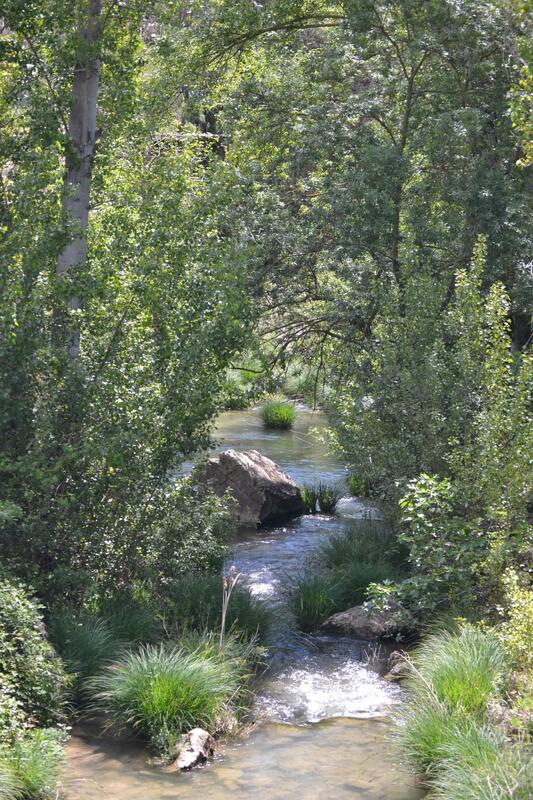 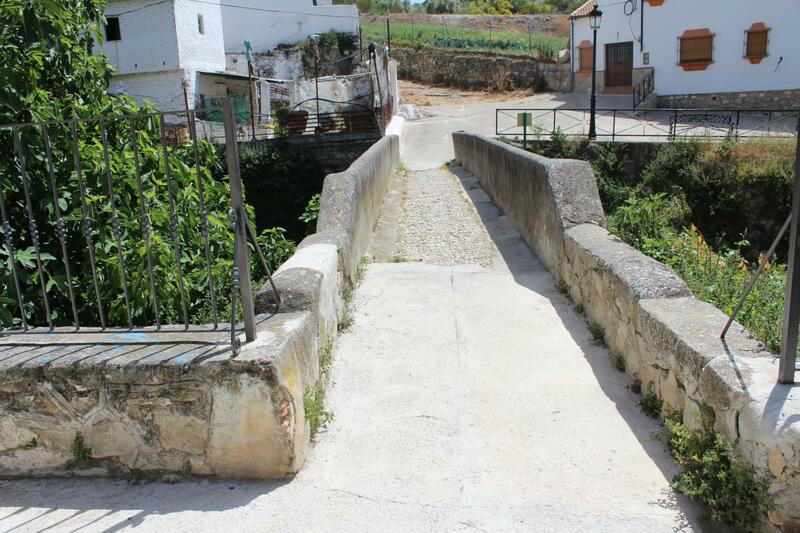 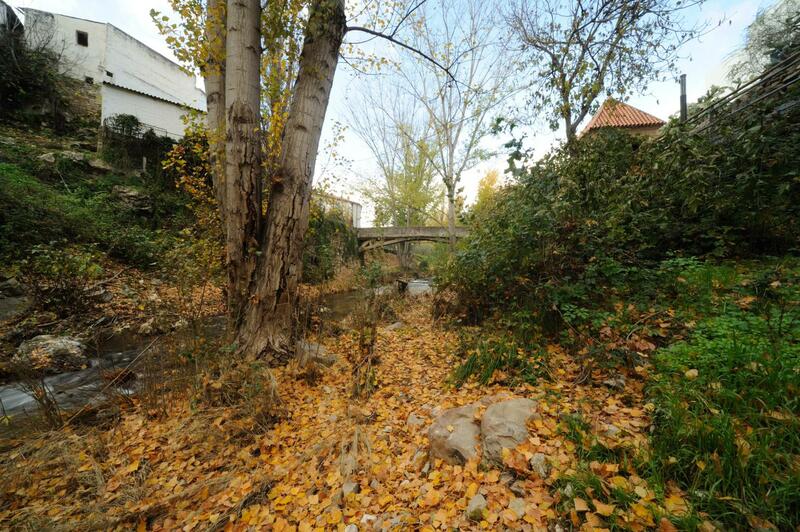 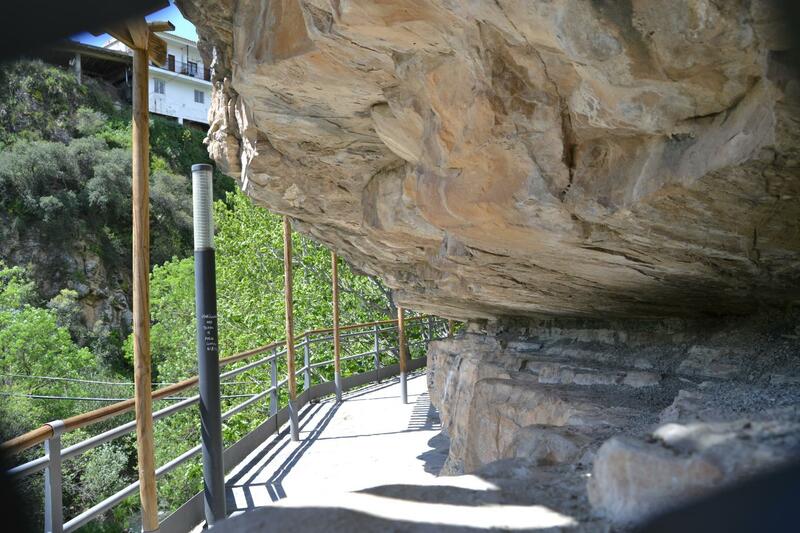 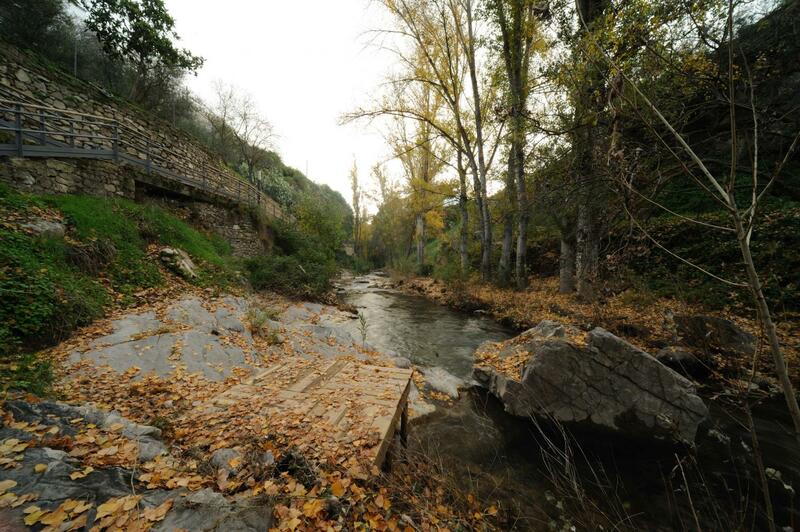 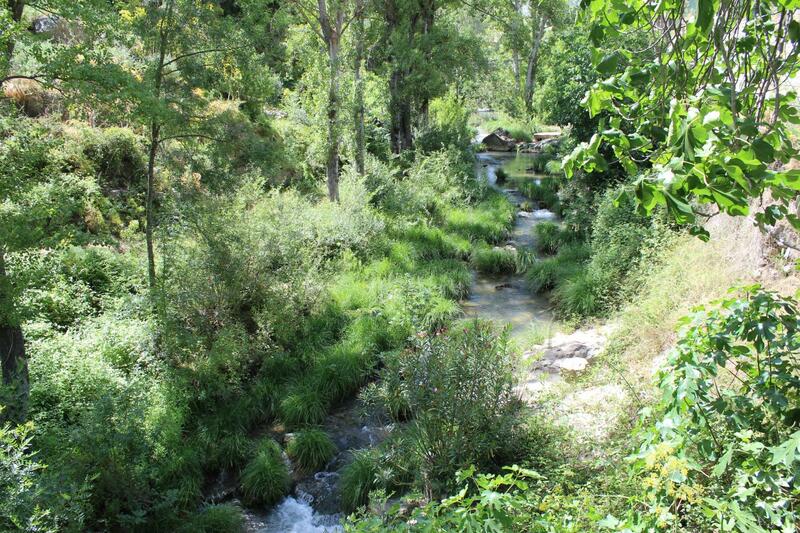 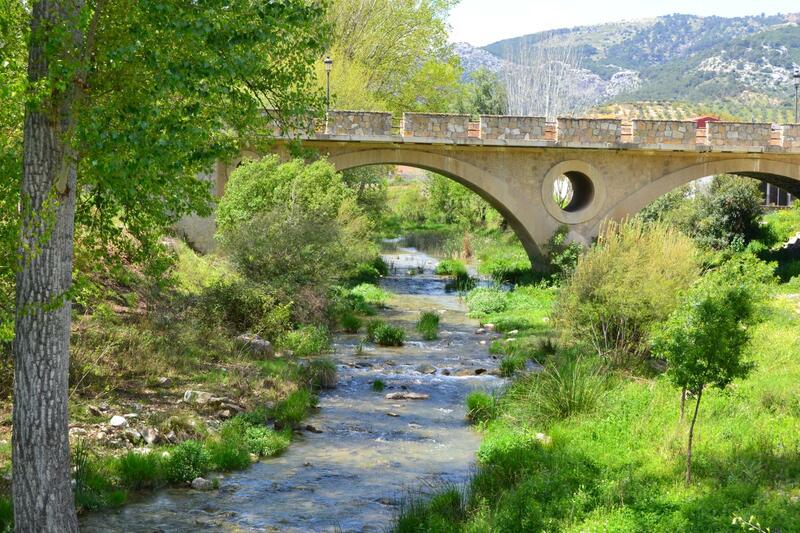 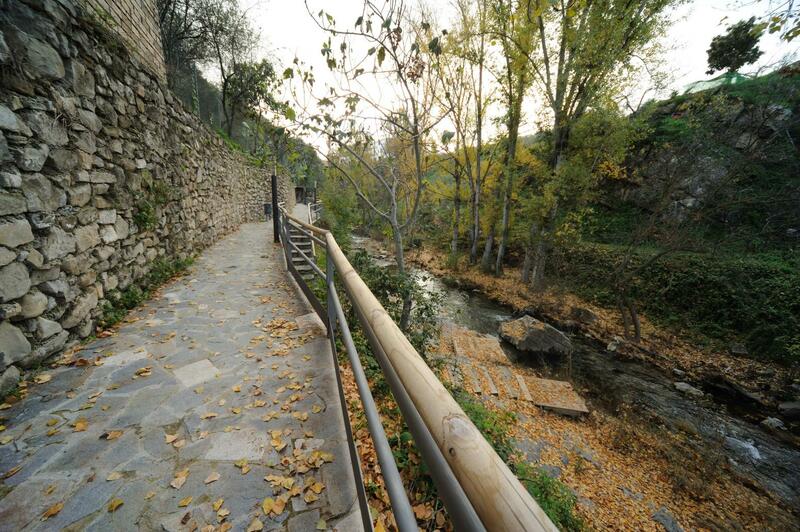 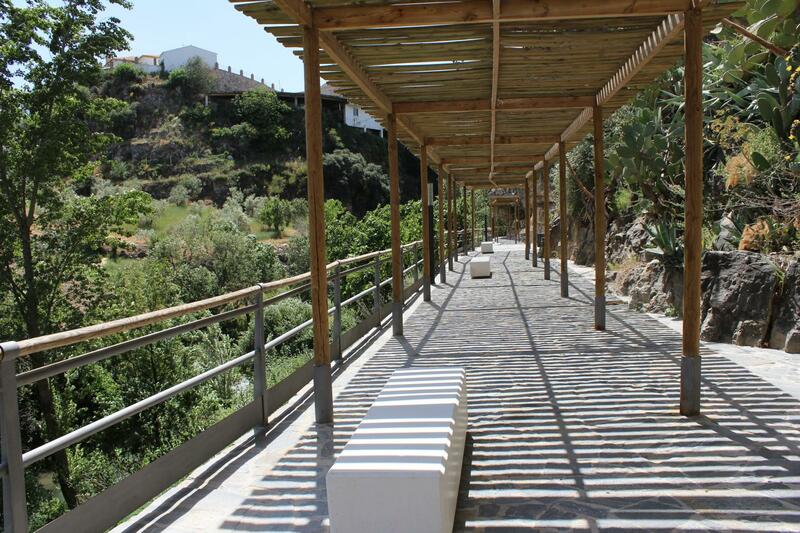 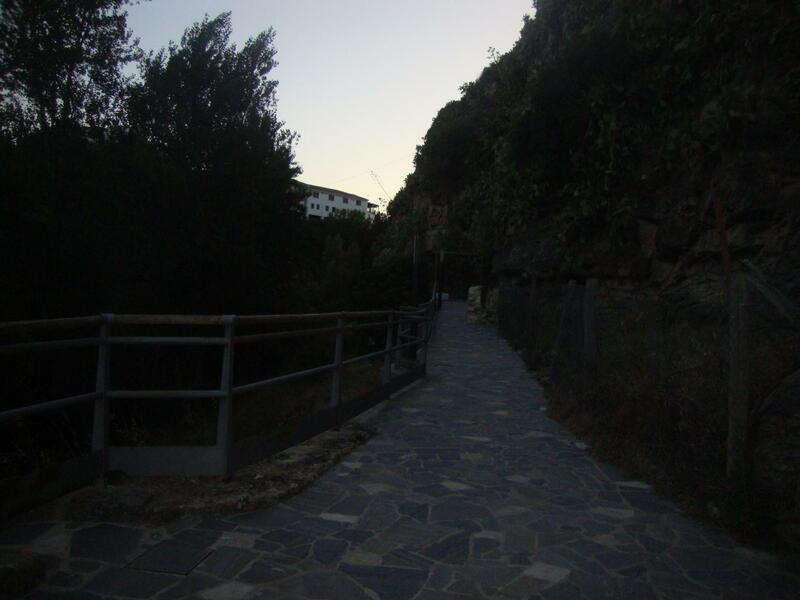 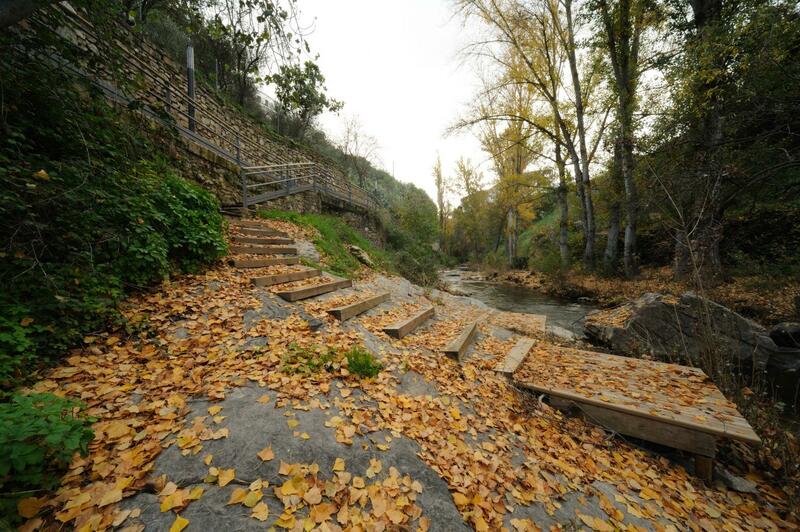 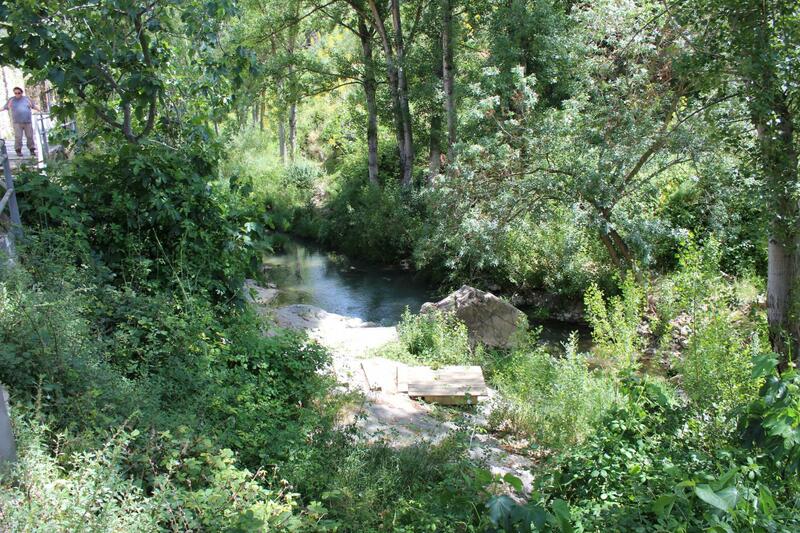 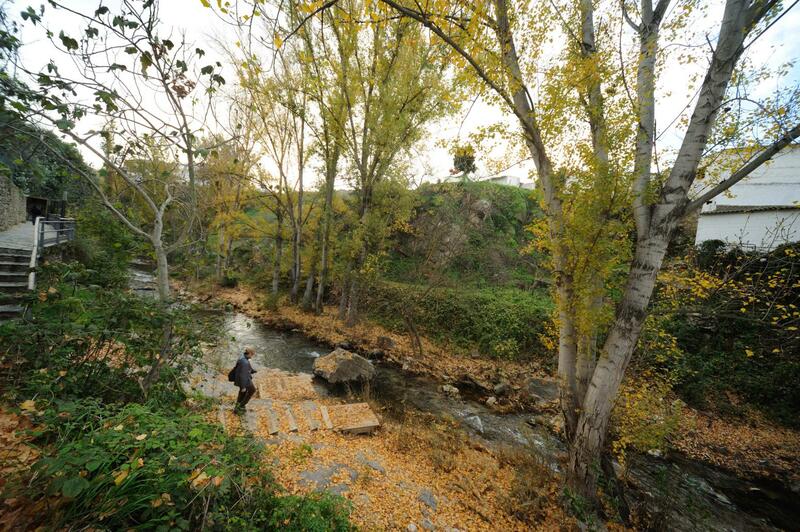 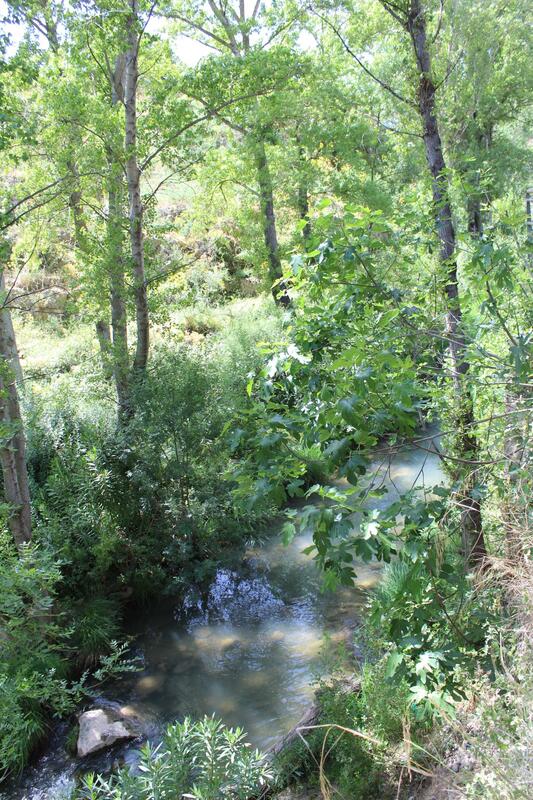 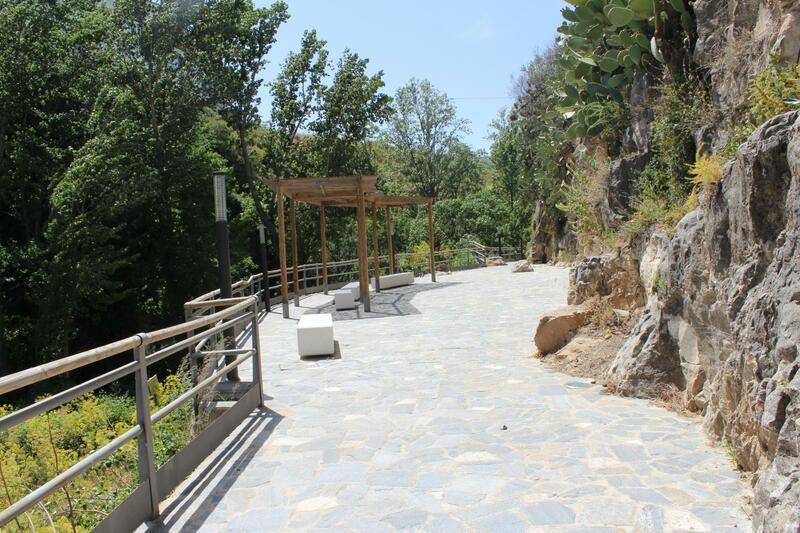 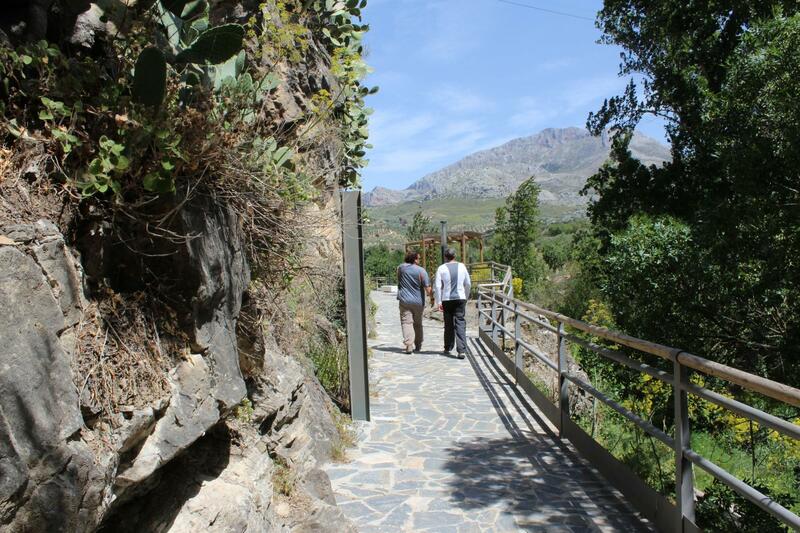 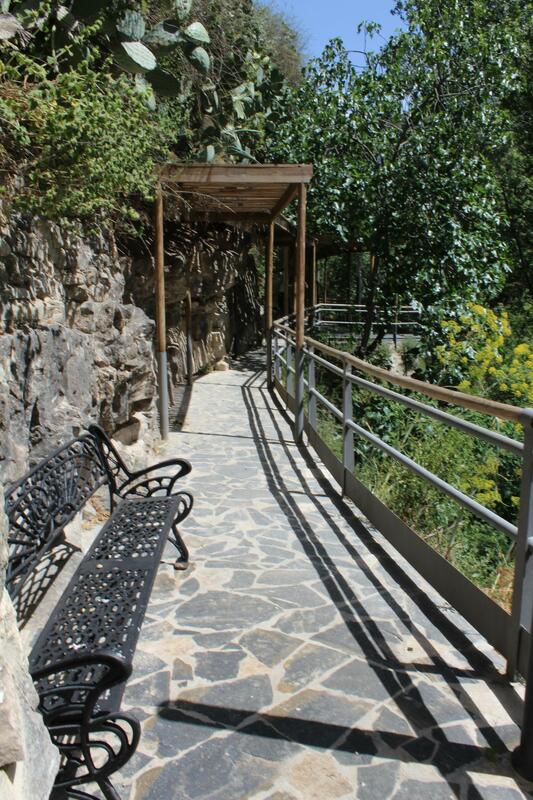 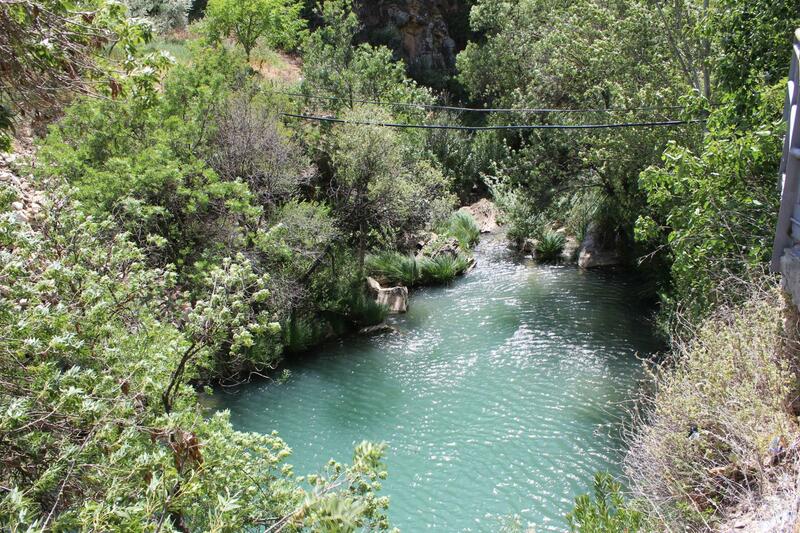 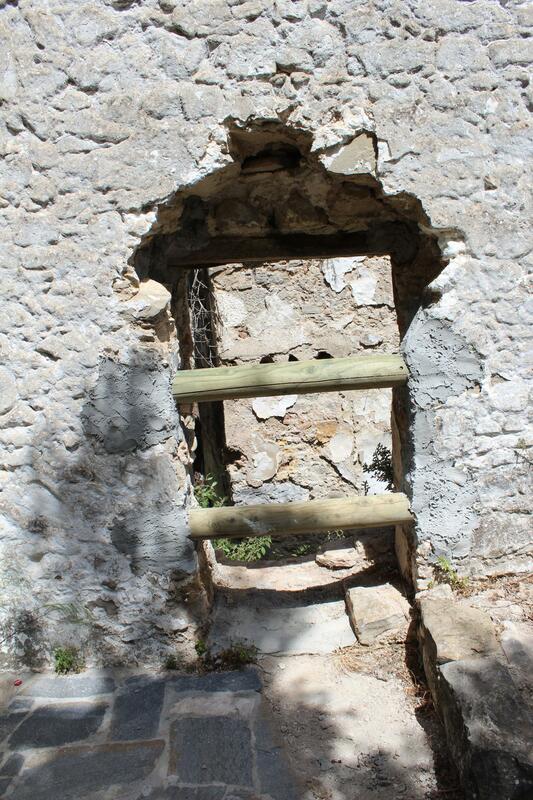 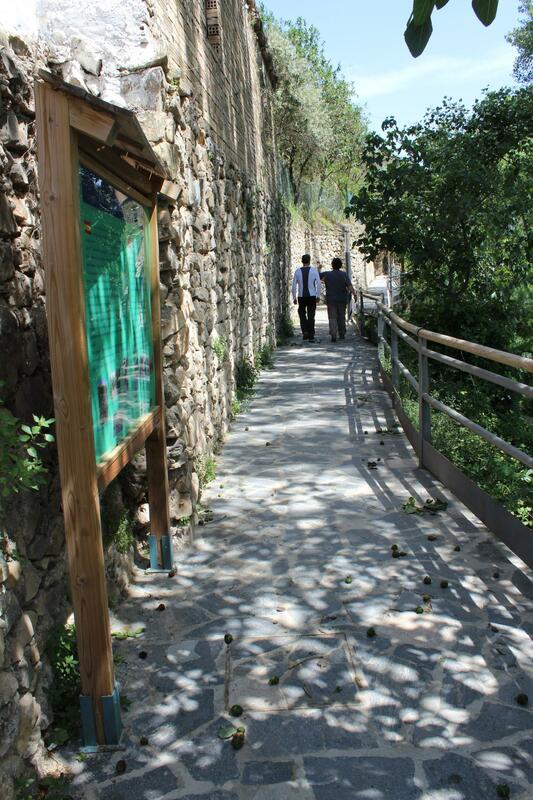 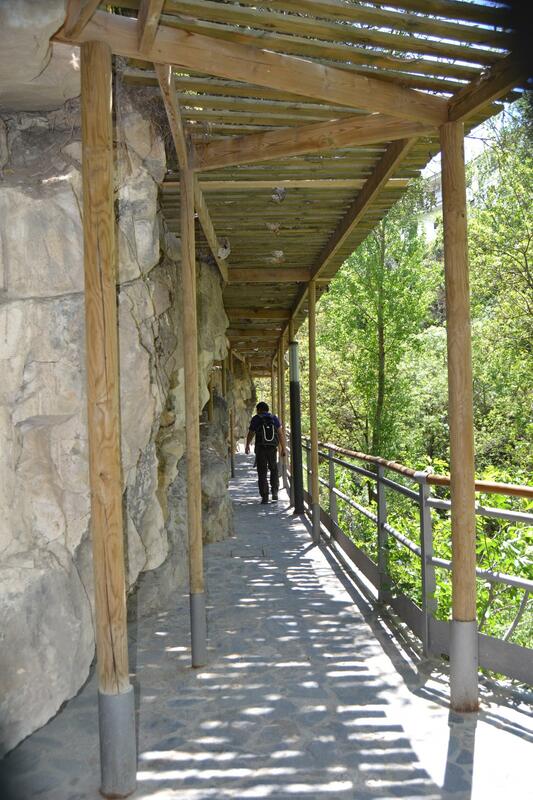 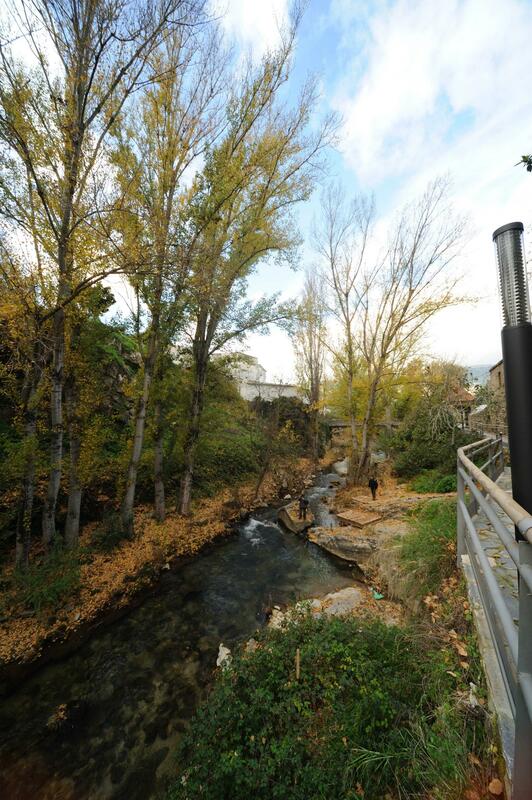 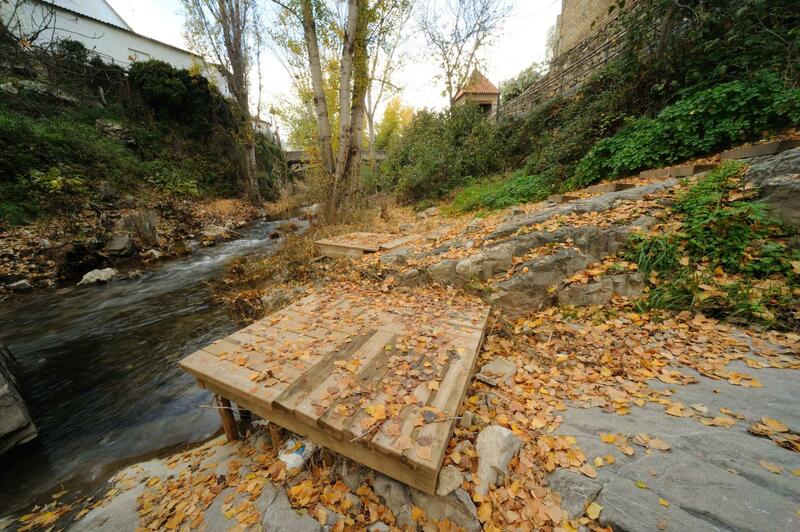 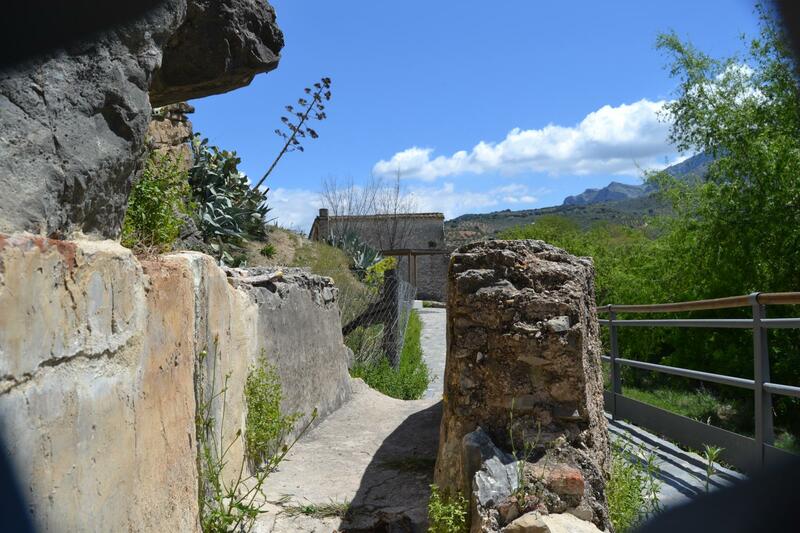 The Acequia del Molino [Canal of the Mill] is part of the Sierra de las Nieves Natural Park. 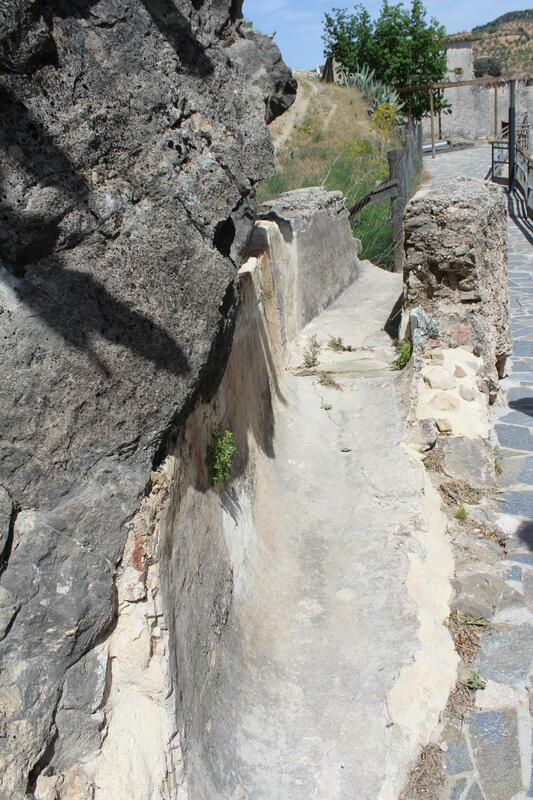 This medieval irrigation channel used to supply with water a flour mill that is in ruins today. 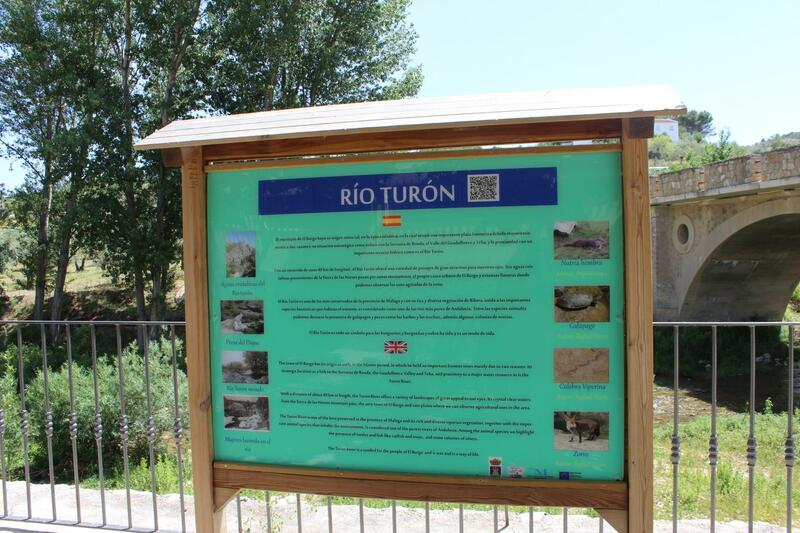 It flows along the banks of the River Turón. 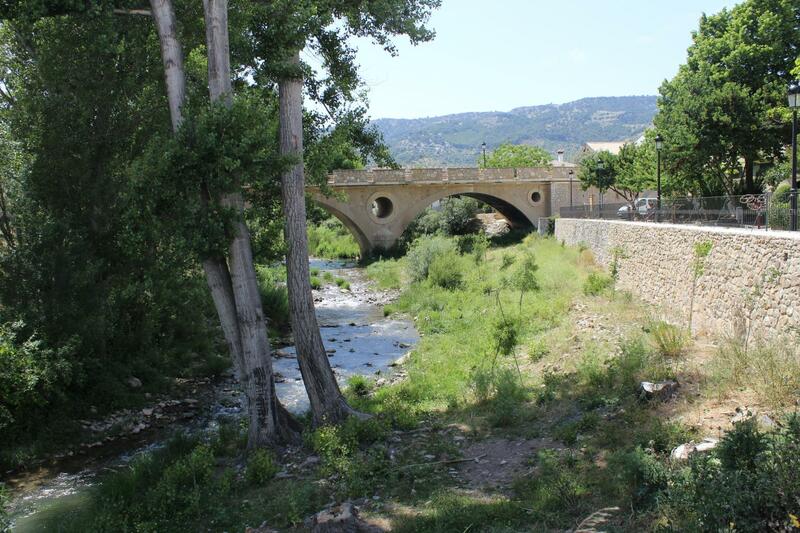 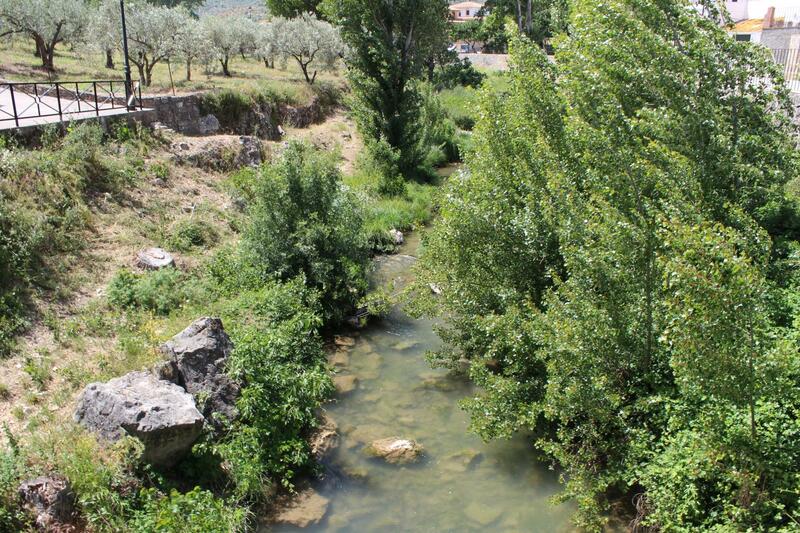 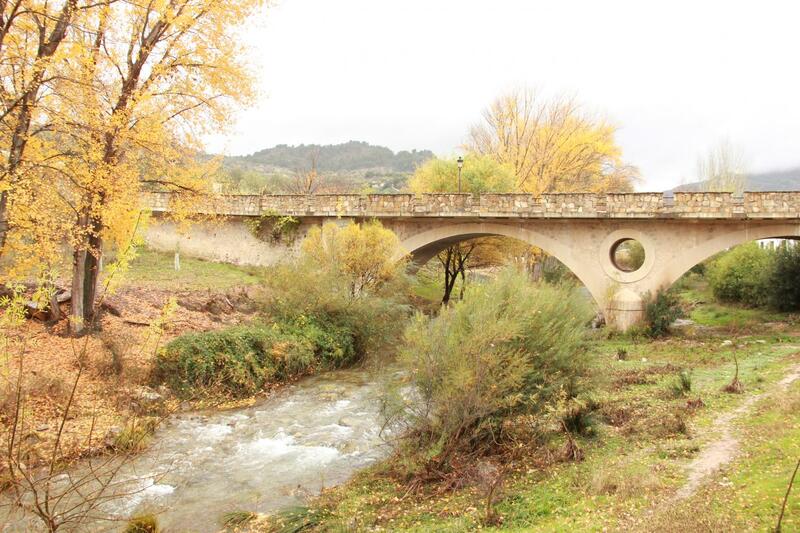 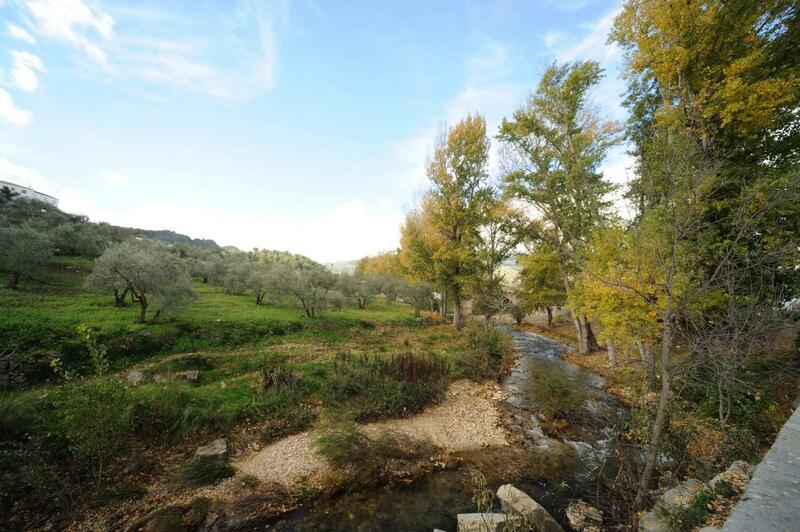 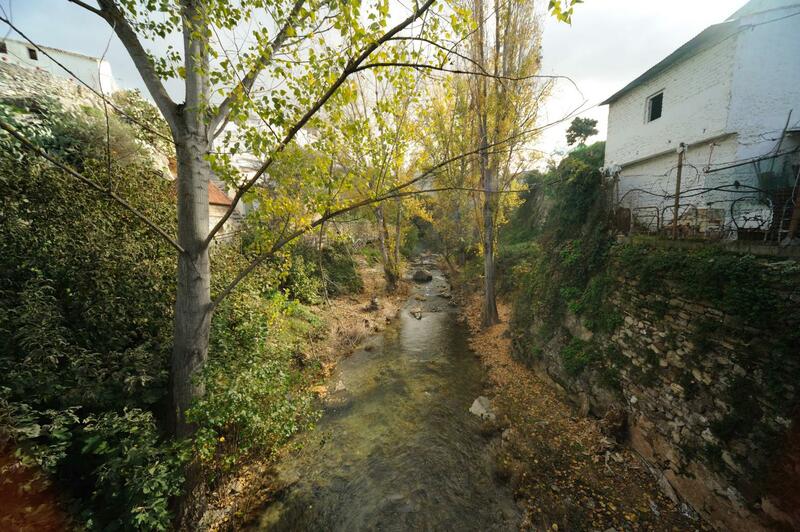 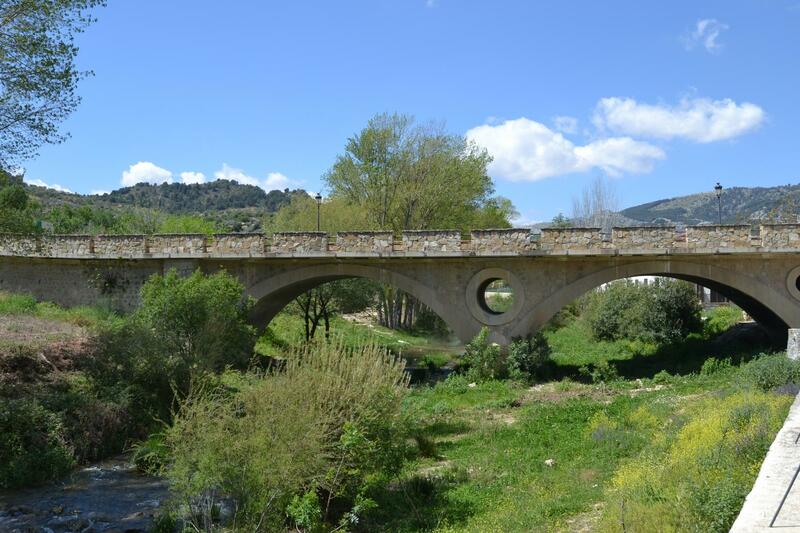 The river is called El Burgo from its source until the town, when it gets its new name, pure waters and a lush bank. 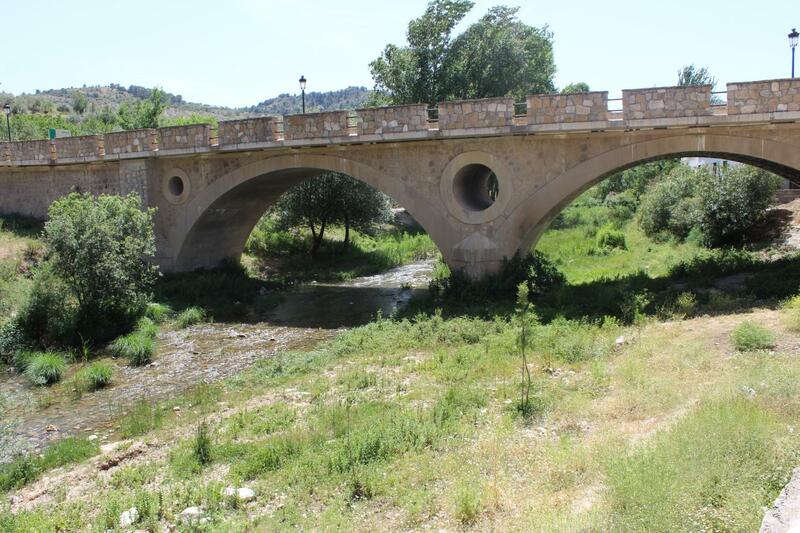 The small town of El Burgo could not exist without the river that made of it a farming town whose industry depends on the power of water and mills. 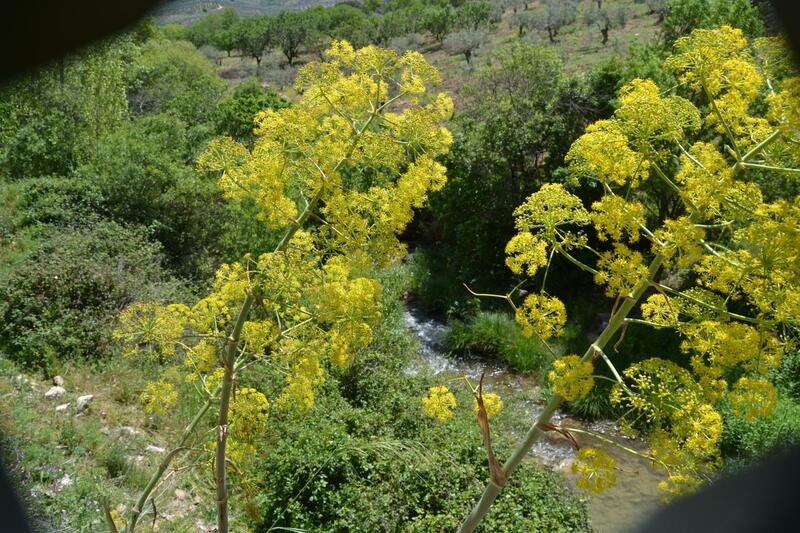 Nowadays, it also provides it with drinking water. 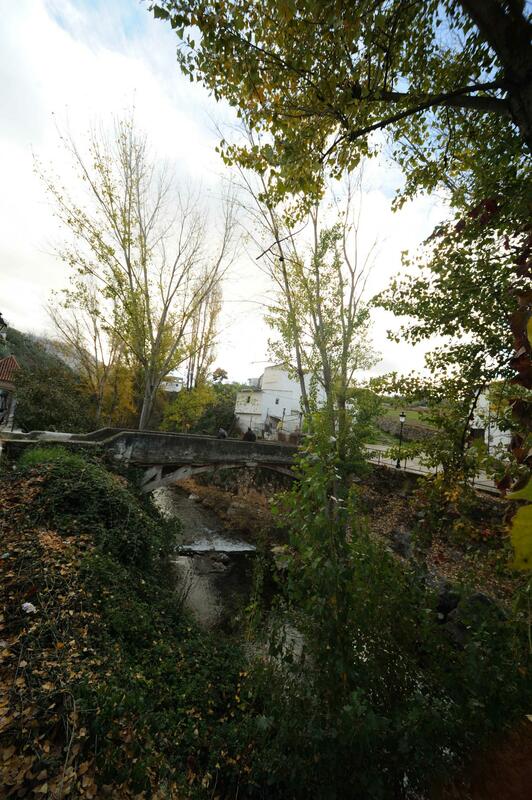 Today, there are the ruins of an old channel, which led water to the old water mill called at first Flour Factory, and later The Factory of Salvador. 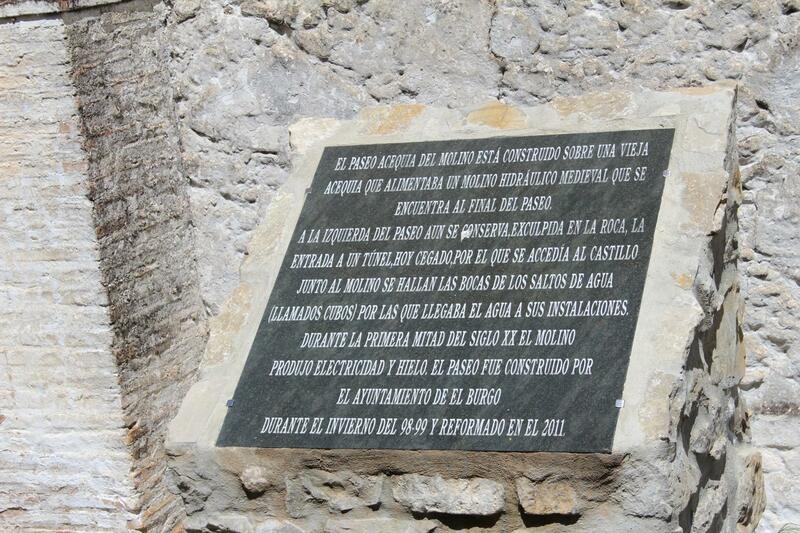 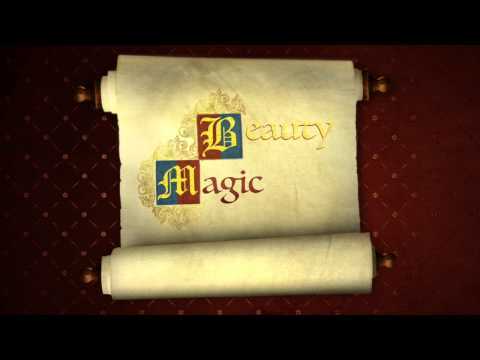 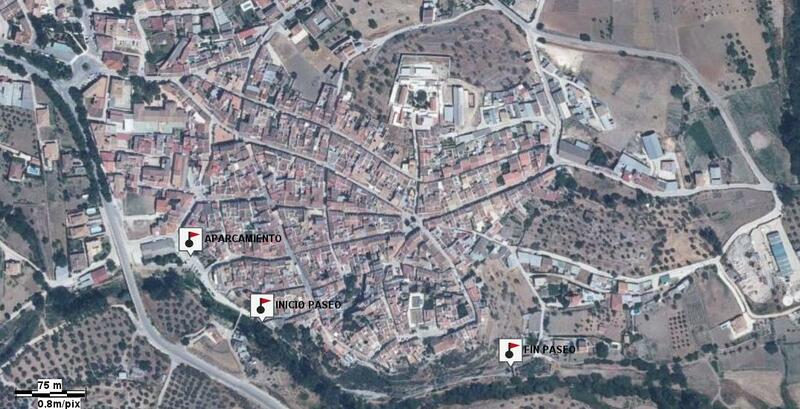 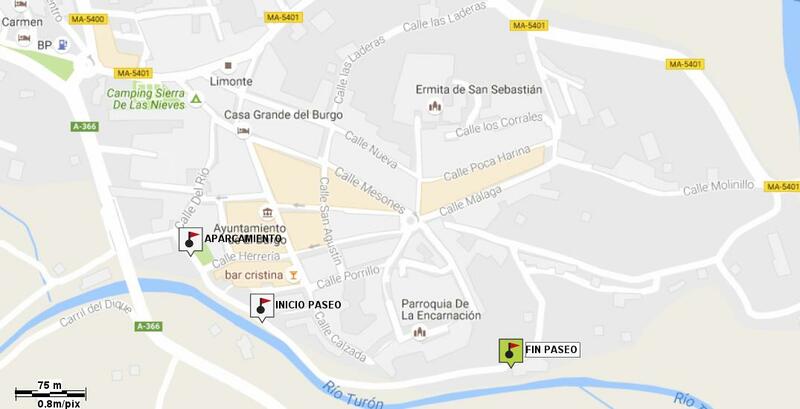 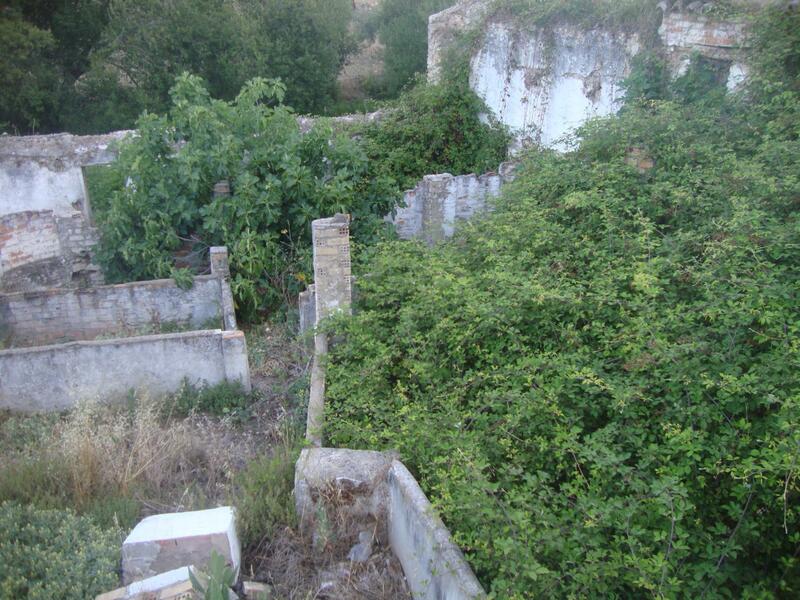 There used to be four flour mills in El Burgo (The Fuensanta Mill, The Mill of Salvador, and two more in Los Bujeos). 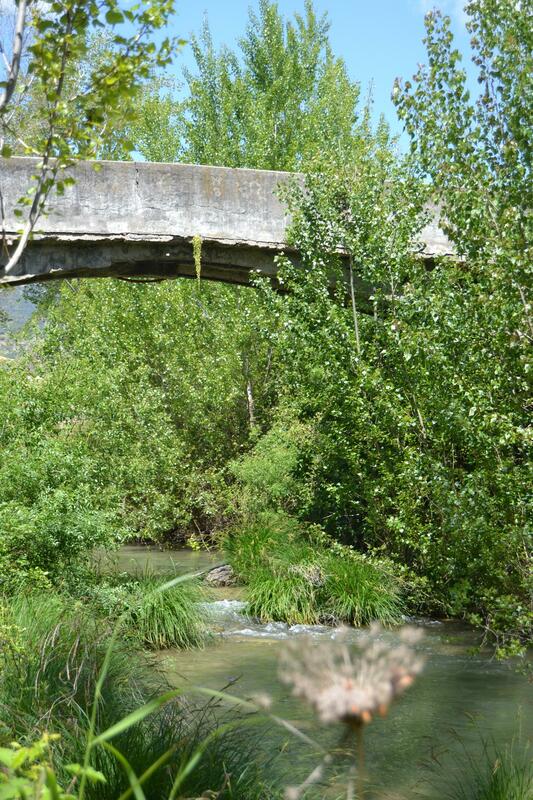 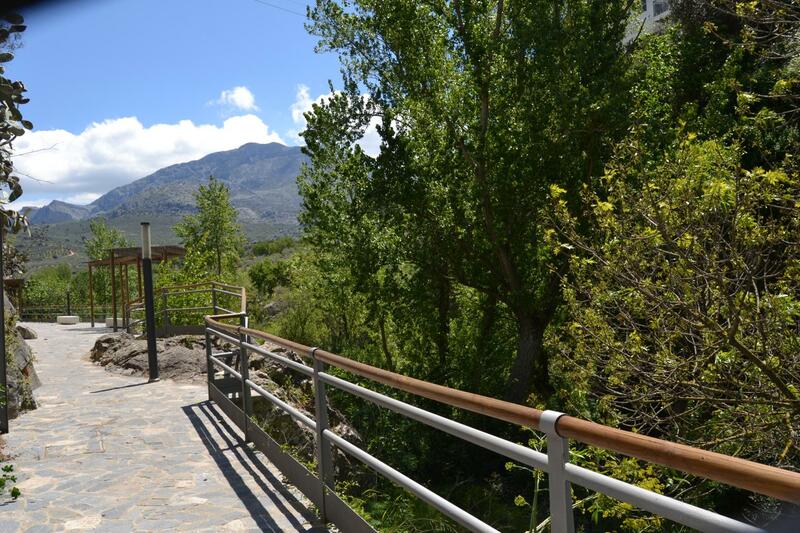 The trail that starts at the Acequia del Molino allows us to enjoy beautiful views of the River Turón, its fish and turtles. 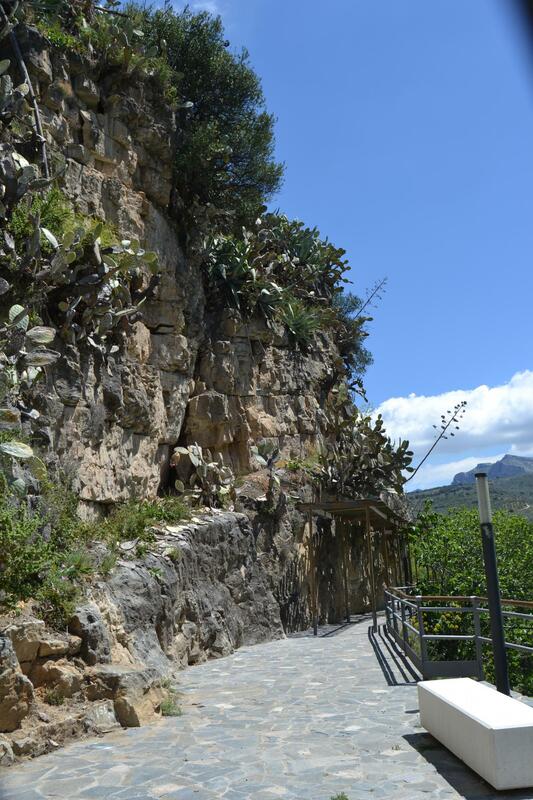 There is, as well, the gorgeous landscape that stretches from the top of the mountains Sierra de la Cabrilla or the Sierra Prieta to their bottom. 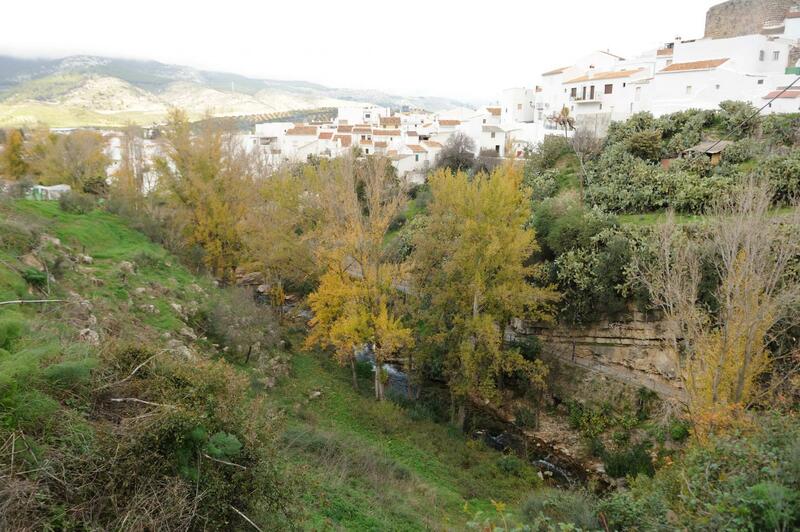 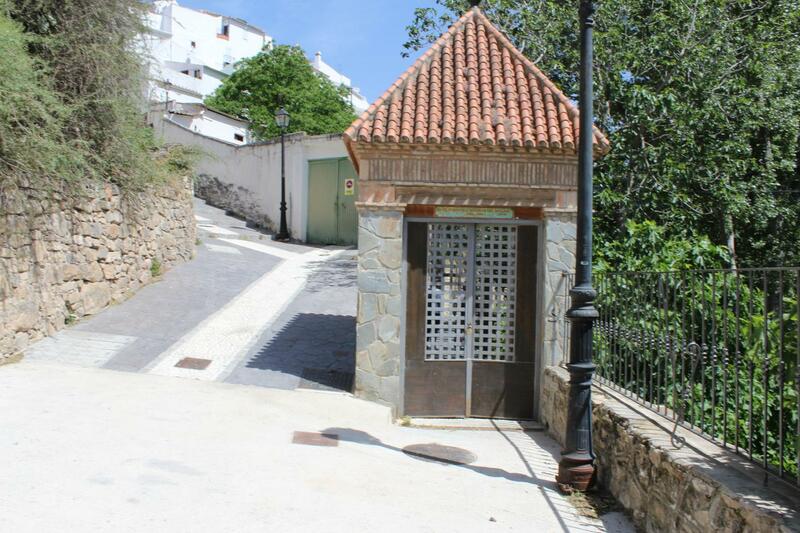 The town of El Burgo lies on the 591 metres high hill that is the entrance to the Serranía de Ronda (the Ronda Mountains), coming from the Valley of Guadalorce and the town of Antequera. 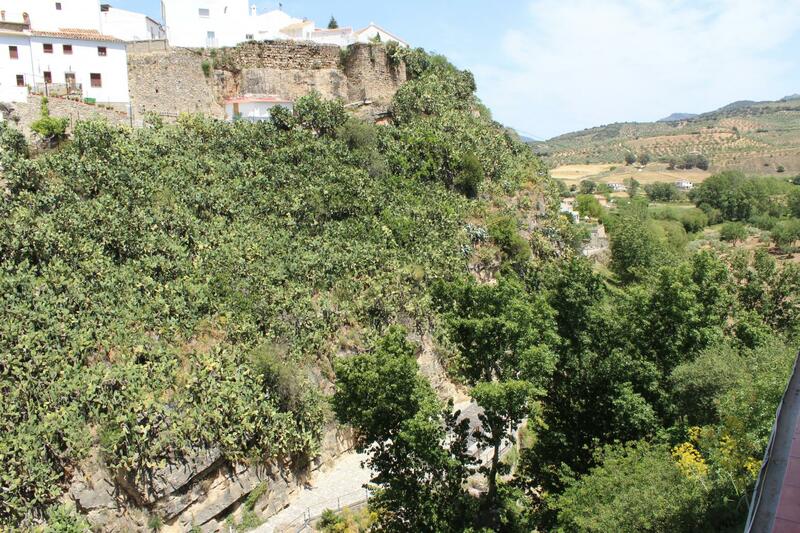 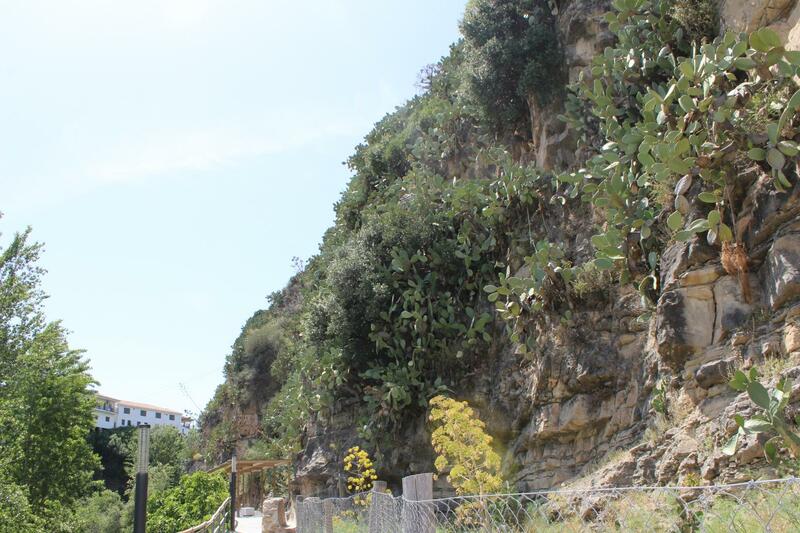 The fortress of El Burgo was the stronghold during the defense of this area in the rebellion of Omar Ben Hafsún, Muladi leader from Málaga. 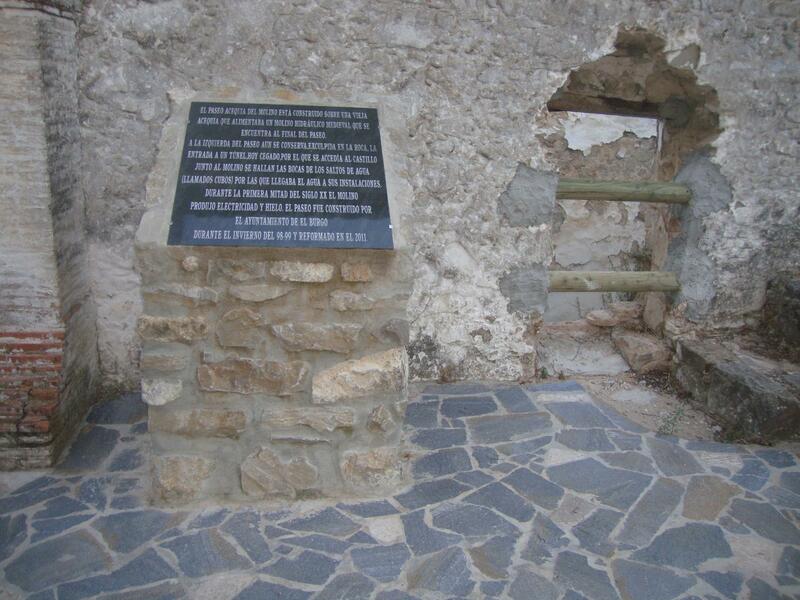 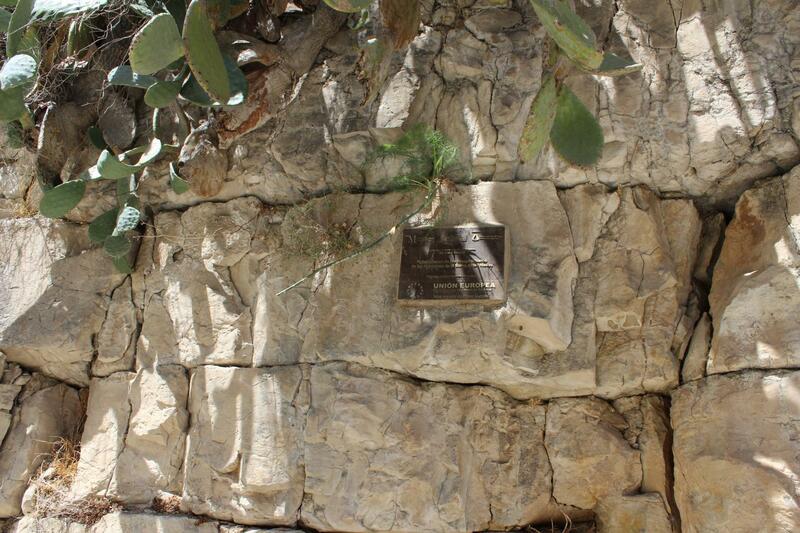 At the top of the town, the fortress ruins reveal their Muslim origin. 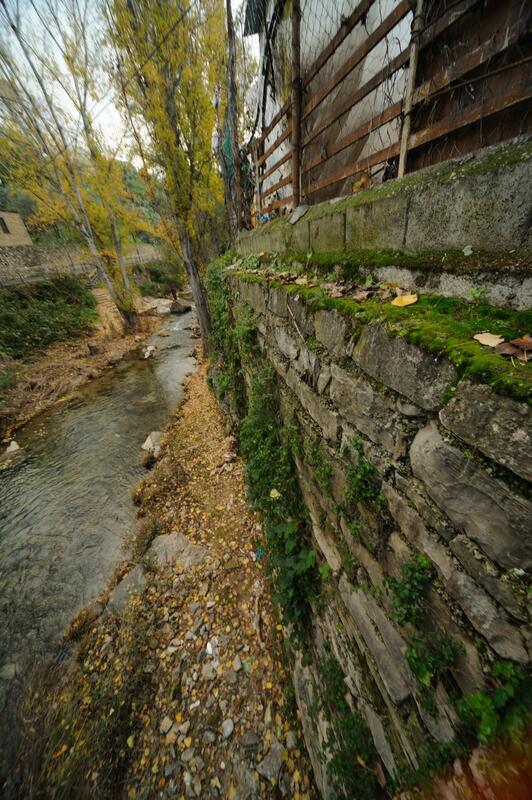 The wall ruins can still be seen. 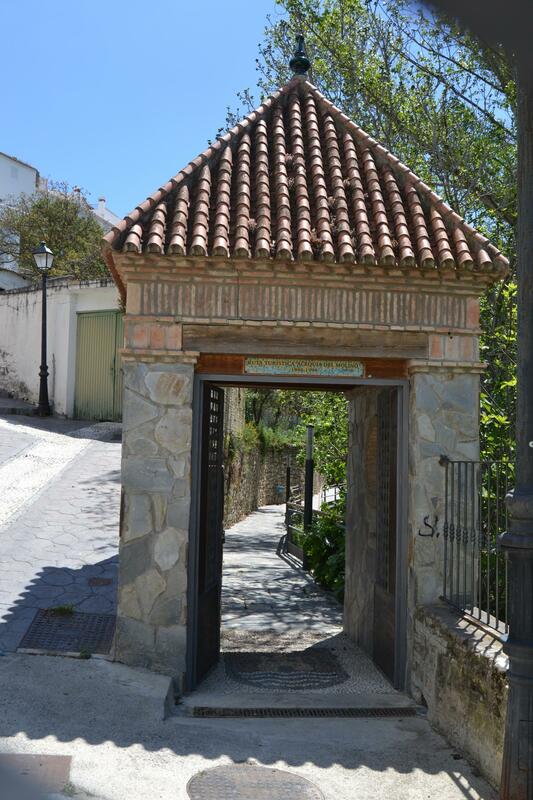 There is the church Nuestra Señora de la Encarnación (Our Lady of the Incarnation), built in 1498 next to the castle, as the most important architectural achievement of the town. 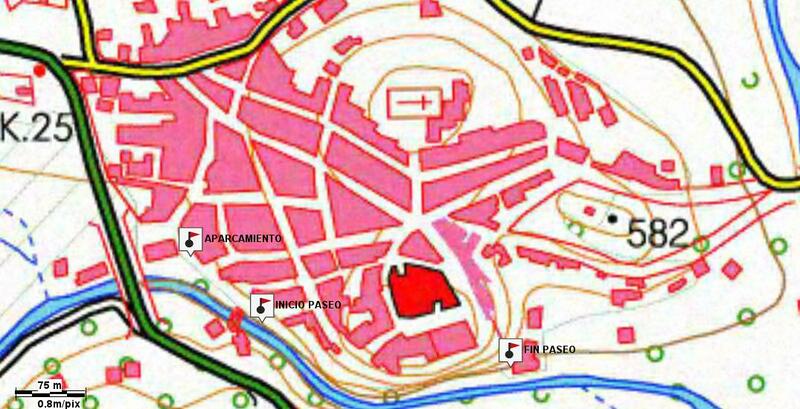 The lower part of the town shows Christian influence on urban architectural structures. 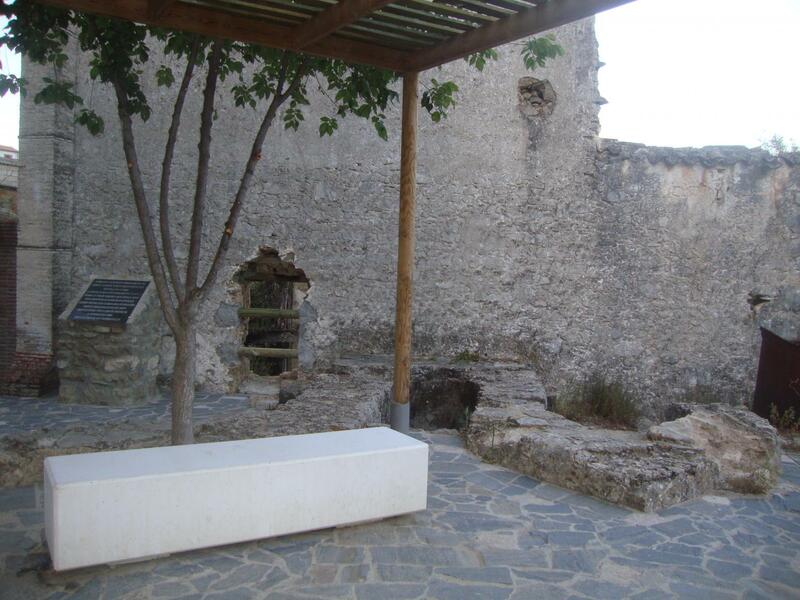 Recently, new buildings have shown that its growth follows modern urban and planned development. 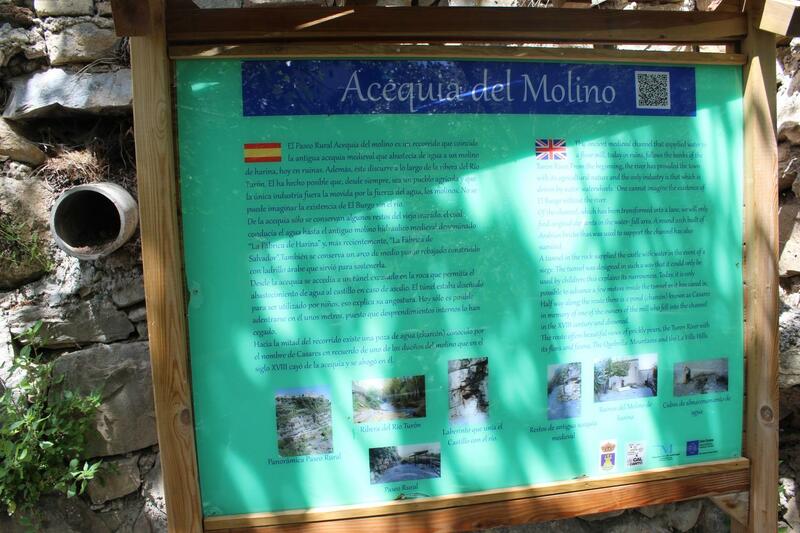 The Acequia del Molino embraces a complex mixture of cultures, which converts it into a peculiar area of tourist interest.